Last year our friends Renny and Calvin visited us and saw the small forest of tomatoes we grow in the conservatory. 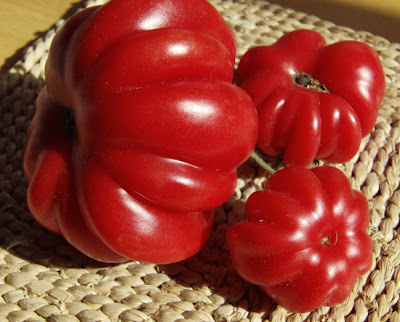 When they got home they sent us a packet of Cuore d'albengo tomato seeds to try. It was late in the season for sowing but we put in a tentative 2 seeds - with one fine specimen reaching the roof! Eventually it produce half a dozen smallish fruits and one apple-sized which taste delicious and very sweet. This year we've planted more and are looking forward to more and bigger tomatoes in late summer.